GFWC is distinguished from other service organizations by the breadth of our outreach. Our community service programs span all areas of the lives of our members, their families, and communities: arts, conservation, education, home life, public issues, and international outreach. 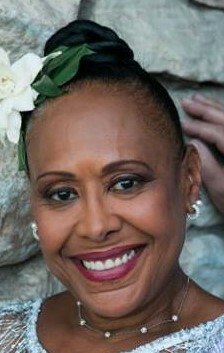 GFWC has earned a reputation as a powerful force in the fight against domestic violence. GFWC was recognized on the floor of the United States Senate as “a gem among our midst” by then-Senator Joseph Biden (Del.) for our work in bringing hope to victims and survivors of domestic violence and abuse, and our early support for the Violence Against Women Act. Below, organized by decade, are selected accomplishments and highlights that tell the GFWC story. 1890: Jane Croly, founder of Sorosis, extended an invitation to women’s clubs throughout the United States to attend a ratification convention in New York City. Sixty-three clubs attended on April 23-25 and took action to form the General Federation of Women’s Clubs. 1898: GFWC unanimously passed a resolution against child labor. With the help of clubwoman Jane Addams (1860-1935), child labor became a major area of concern for the Federation. In 1901, Addams headed the Federation’s Child Labor Committee to work for the maintenance and improvement of child labor laws. 1899: GFWC’s Chicago Woman’s Club supported the juvenile court law, the first ever to be passed in the United States. This law became the model for all subsequent juvenile court laws, many of which were passed at the insistence of GFWC clubwomen. Julia Lathrop (1858-1932) led this club effort and was appointed by President William Howard Taft to head the Children’s Bureau in 1912. 1901: The 56th Congress of the United States chartered GFWC and designated that the Federation be headquartered in Washington, DC. 1910s: GFWC supported legislation for the eight-hour workday, workplace safety and inspection, and workmen’s compensation. Members also supported prison reform legislation. 1916: GFWC worked with the Children’s Bureau to promote National Baby Week. Over 2,000 clubs participated by focusing on infant and maternal mortality, birth registration, and public health facilities. The Federation’s efforts resulted in the passage of the Sheppard-Towner Act (1921), which advanced maternal education. 1919: Under the direction of the YMCA, GFWC created the Overseas Service Unit and sent 100 young women to Europe to assist wounded soldiers in the aftermath of World War I. 1921: GFWC created the Indian Welfare Committee, which worked improving both education and health facilities on reservations, as well as preserving Native American culture. 1922: GFWC Clubwomen purchased 1734 N Street, NW in Washington, DC to serve as the Federation’s International Headquarters. In addition to staff offices and rooms for meetings and receptions, one floor was designated to serve as an apartment for the International President. 1930s: Having founded over 474 free public libraries and 4,655 traveling libraries, women’s clubs were credited by the American Library Association with establishing 75 percent of America’s public libraries. Supporting local libraries continues to be a Federation priority today. 1932: GFWC established the Junior Department in response to an increasing number of younger women participating in volunteer community service. 1934: GFWC began a 10-year study to review the question of the Equal Rights Amendment (ERA). In 1944, GFWC adopted a resolution in support of the ERA, which the Federation continues to support today. 1940: GFWC celebrated its Golden Jubilee commemorating 50 years of Federation work. 1944: Through the GFWC Buy a Bomber campaign during World War II, state federations sold war bonds worth $154,459,132–enough money to purchase 431 planes. 1945: GFWC was one of the five women’s organizations chosen to participate in the conference to form the United Nations. At the conference, GFWC representatives supported the ratification of the United Nations Charter. 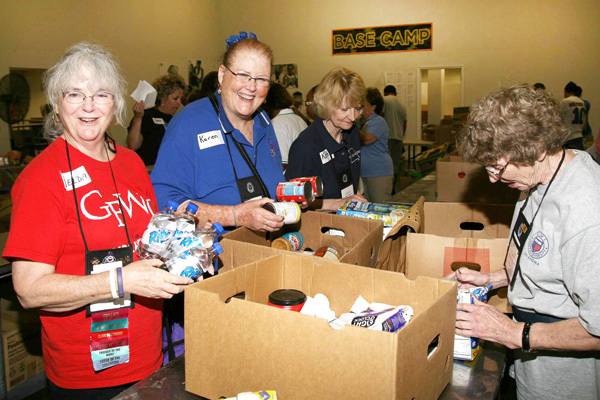 1950: GFWC began its relationship with the Cooperative for American Relief Everywhere (CARE). The organizations jointly distributed relief shipments to Korea. 1955: GFWC first established the Community Achievement Program, which recognized clubs that best improved the quality of life in their communities. 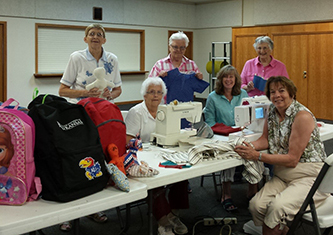 Now called the Community Improvement Contest, it remains one of GFWC’s longest running and most important efforts. 1960: Brighten the Night was a nationwide Federation campaign for street lighting to prevent crime and accidents. 1961: GFWC’s Women’s Crusade for Seat Belts program resulted in the installation of more than one million seat belts over the course of one year. 1965: GFWC was awarded a stamp by the United States Post Office in honor of its 75th anniversary. 1970s: GFWC responded to the startling rise in crime with a citizen-based grassroots program, Hands Up, which was applauded as a “valuable public service” by President Gerald R. Ford. 1984: GFWC founded the Women’s History and Resource Center (WHRC) to collect, preserve, interpret, and promote primary and secondary source materials and information on GFWC and women in volunteerism. 1986: In keeping with GFWC’s commitment to conservation, the Federation instituted programs to protect and preserve endangered species. 1990s: GFWC actively supported the passage of the Violence Against Women Act; the Americans With Disabilities Act; the Family and Medical Leave Act; and legislation supporting handgun control. 1990: GFWC celebrated its centennial anniversary in New York City. 1994: GFWC founder Jane Cunningham Croly was inducted into the National Women’s Hall of Fame in Seneca Falls, New York. 1997: GFWC renewed its commitment to libraries with the Libraries 2000 project. Over a five year period, GFWC clubwomen raised and donated $13.5 million to public libraries and public school libraries across the nation. 2000s: GFWC members contributed $180,000 for a fully-equipped ambulance for use by the New York Fire Department in response to the loss of equipment suffered during the terrorist attacks on September 11, 2001. 2011: GFWC introduces the Success For Survivors Scholarship, created as part of our efforts to highlight the importance of rebuilding one’s life after experiencing intimate partner violence. Each year, GFWC awards $2,500 scholarships to help intimate partner survivors obtain a post-secondary education that will offer them the chance to reshape their future by securing employment and gaining personal independence. 2015: GFWC celebrates 125 years of Federation on April 24.